The Brooklyn Academy of Music (BAM) South tower in New York is a mixed-use space that uses a porous design and a terraced plaza to enliven an underused section of the district. In the heart of Brooklyn, New York’s cultural district, a new 32-story building was created by Ten Arquitectos’ Enrique Norten with executive architect Ismael Leyva. The goal of this project was to draw people into the space. The Brooklyn Academy of Music (BAM) South tower is a mixed-use building that employs a porous design and a terraced plaza to enliven an underused section of the district. The building’s base provides street-level entry into retail areas. A stepped plaza follows its form, extending upwards to allow for outdoor programming while drawing pedestrians toward the 4645-m2 (50,000-sf) cultural space on the tower’s lower floors. This designated area holds a museum, dance studio, branch of the local public library, and room for the expansion of the BAM cinemas. The remainder of the tower contains rental apartments, 20 percent of which are for affordable housing. BAM South is host to a high volume of foot traffic on and around its grounds. 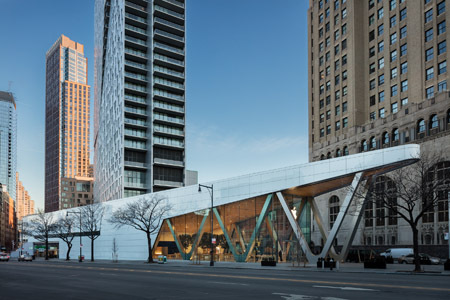 A cladding material was used along the building’s base that would be durable enough to withstand pedestrian use and New York’s weather, while also meeting the design team’s aesthetic goals. According to the firm’s website, Ten Arquitectos envisioned a façade that would pick up the colors of the streetscape and put the focus where it should be. A faceted metal façade helps accomplish this mission on the tower. To reflect the culture of the district, on the building’s ground floor, the exterior podium is made with 1394 m2 (15,000 sf) of 15-mm (5/8-in.) white, crystallized glass ceramic panels. The panels have a high resistance to staining, pollution, and graffiti to ensure longevity. The crystallized glass ceramic panels have a low thermal expansion rate and are lighter and stronger than natural stone. The building team installed the panels over a 15-mm reveal, open-joint rainscreen on a ‘back-cut’ anchor that is mounted on an engineered strut support system. This design allowed the panels to be installed in a rainscreen application while providing a modern aesthetic. To ensure all goals were met, the project’s engineering team, in partnership with the design team, modeled and constructed the BAM South base podium façade using a building information modeling (BIM) software.